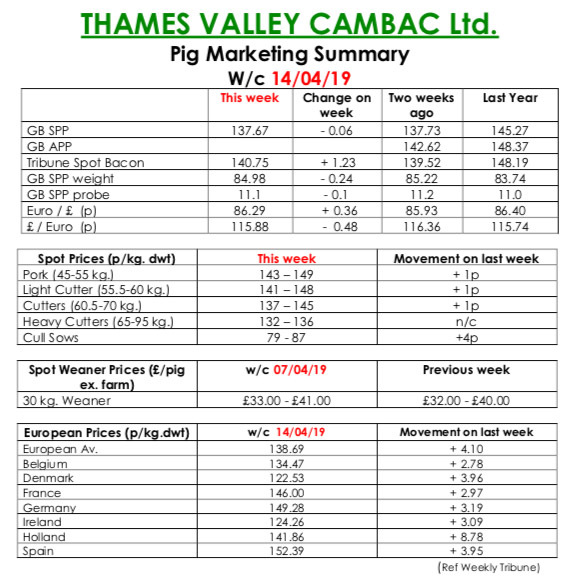 This week’s Slaughter Pig Marketing Summary from Thames Valley Cambac reported that trading for the first of two successive short weeks was relatively issue free with some processors opting for working on Good Friday. This probably betrayed the good undercurrent of demand that has been helped in recent weeks by exceptional export opportunities from China. However, the market is currently flat with a large quantity of pork in cold stores that was placed in readiness for a Brexit that subsequently never happened. Stores are now being emptied, and then the market should become more reactive. One major added a penny to its contract contribution, while others stood on. Supply was on the tight side again and average weights are reducing slowly, but still over 1kg heavier than last year. Fresh meat markets showed odd signs of improvement again with the hope of some Easter trade. Cull sows values continued to appreciate on the back of better export trade. European markets continued to surge ahead with Holland the stand out riser, up 9.5 eurocents. Price quotes in sterling were further enhanced by a stronger Euro that ended the week up 0.48p at 85.89p. The Weaner Marketing Summary, for week commencing April 7, reported that supplies of 7kgs weaners improved slightly again, but 30kgs stores remained scarce. Prices were a touch better as a result. 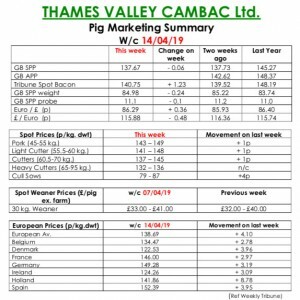 The prices announced by the AHDB saw the weighted average for a 30kgs store pig fall 42p to £47.45, and the weighted average for a 7kg weaner rise by 80p to £36.03.